On the 11th hour, of the 11th day, in the 11th month one-hundred years ago today, the Armistice with Germany went into effect, formally ending World War I. In 1954, the day of remembrance was changed form Armistice Day to Veterans Day. 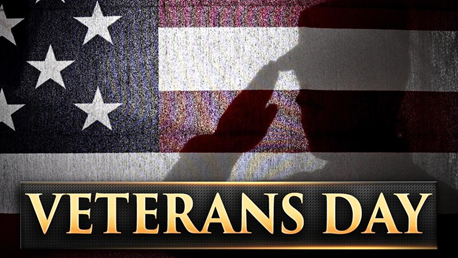 To all of you who have served and are currently serving, we stand and salute you. Thank you. Hopefully, we can show our gratitude by making you smile and putting a few extra bucks in your pocket with today's stakes races at Aqueduct. Ten, two-year-old fillies will run six-furlongs on Aqueduct's outer turf for the STEWART MANOR STAKES. With the terrible twos, you never know what to expect. One race a horse can look like a dragon slayer and the next race a dragonfly. In last year's November through April meet, there were 38, six-furlong turf races. Fifty-three percent were won by horses labeled early speed, with 34% going wire-to-wire. On average, the typical winner ran 2.6th and the quarter-mile marker and second in the opening half-mile. DRAGIC bobbled at the start of his last race, rushed up, but was passed late finishing third. She'll look to get off to a better start and leave the excuses behind. REGAL GLORY won her debut with ease. She was in traffic and split horses for the win. That's not always and easy task for young horses. INTRODUCED broke her maiden in her second attempt, bet down to $0.40. She'll need to carry the form to the higher level. MONETTE is making her second US start after a successful early career in France. She closed hard in a Grade 3 last out, missing by a head. Race nine, the $125,000 NEW YORK STALLION STAKES is for three-year-old an upward fillies and mares that are eligible for the New York Stallion Series Stakes. Eleven hard charging ladies will pound the dirt, running seven-furlongs. As you might expect, seven-furlong dirt races share some similarities with six-furlong races. Early speed wins at 58%, versus 53% for six furlongs, but only 21% went gate-to-wire compare to 34% at one furlong less. For both lengths, the 1/4 and 1/2 mile placements of the average winner is basically the same at seven-furlongs versus six, 2.6 and 1.9 versus 2.6 and 2.0, respectively. Many of the horses we selected in our bonus commentary squarely fit the profile of seven-furlong, Aqueduct dirt winner. "HIGHWAY STAR [PP: 8 ML 8/5] is turning around quickly from last week's Breeders' Cup Fillies and Mares Sprint. The major drop in class should be helpful. FROSTIE ANNE [PP: 10 ML 9/2] has won four of eight at Aqueduct, with two seconds and a third. A horse for the course. FAIR REGIS [PP: 2 ML 6-1] is making her second start off the bench and won her most recent second start. FROST WISE [PP: 9 ML 5-1] should also be better in a second start after a layoff. She's never finished out-of-the-money in seven Aqueduct races." GET OUR FULL CARD AQUEDUCT PICKS PLUS ALL OTHER TRACKS RUNNING! Again, Guaranteed Tip Sheet salutes and thanks all our Veterans. Have a blessed day and good luck at the races.